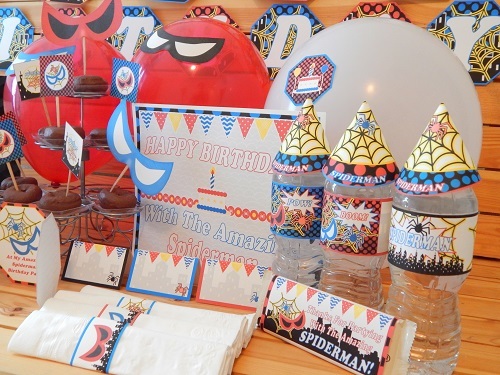 Here's A few ideas on how to use our printable party supplies. 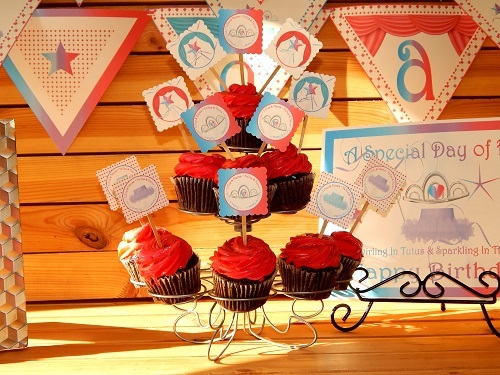 A lot of you have questions & want to know about the different ways to use party printables. We'll list the types of printable products we design & the many ways you can use them, to decorate & create a stylish unique theme party. Our printables are more sturdier & holds well when printed on thick white 65 - 110 lb card stock or index paper. We like to use 110 lb white card stock paper when we print setups, displays, & more! 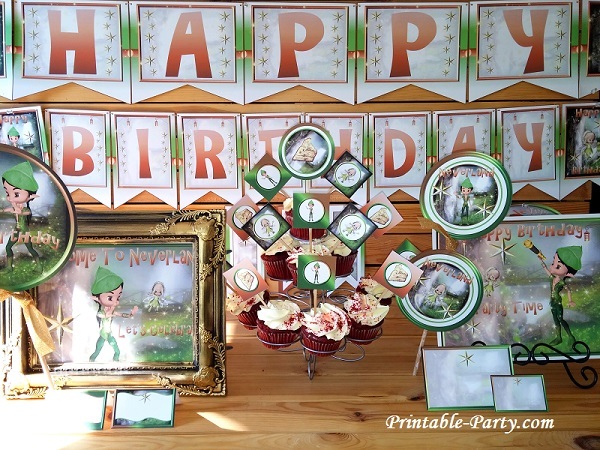 Party printables work well when used to decorate for indoor parties. Printables can also be used outdoors on a nice sunny day with not much wind. 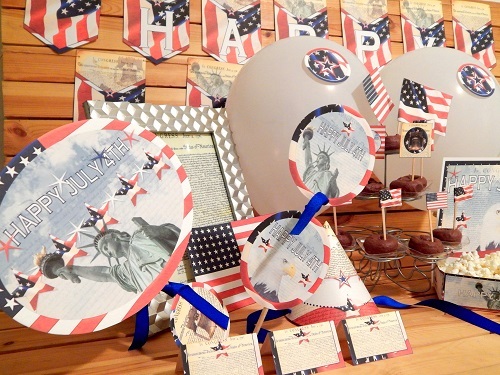 Assembly: Give yourself some time to print, trim, & assemble your printable party supplies. It is recommended that you trim out & assemble your printables at least two through 3 hours before your party. Sometimes it's a good idea to get trimming & assembling done about 1 or 2 weeks prior to your party depending on the size of your guest list & what amount of items you have to trim. Printing: We recommend that you print your PDF party files onto 100lb & up bright white card stock paper. Designs are made to fit onto 8.5x11 inch paper found at any office supplies store. Printable banner letters that come in PDF kits can be used to spell out happy birthday, baby shower, get, well, & more! Banner flags should be hung around party areas. 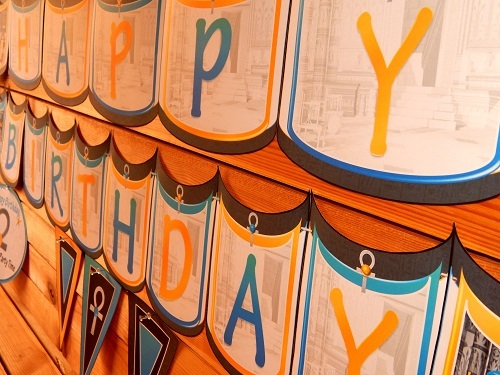 Banner flag letters & decoration bunting flags, are usually strung up onto walls near party tables & even hung onto the main featured theme party table. You can use our banner making PDF printable kits to personalize your parties & occasions to your liking. Spell out a persons name & age, quotes, business names, & anything you'd like to spell to hang for all to see. Party circles come in 8, 5, 3, & 2 inch sizes. You can hang them on strings as garland vertically or horizontal. Party circles can be glued onto large & small wooden or paper lollipop sticks, to be used in table centerpieces or on cakes as cake toppers. Circles can be glued or printed onto sticker paper to be placed onto solid color balloons. You can create party shirts too! You can use party circles to make your party theme eye popping. Tape or glue them onto props, boxes, bags, or hang them from the ceiling from strings along with streamers. Standard sized party cone hats will fit just about any sized person adult or child. Standard hat template can also be used as banner flag decoration. Mini cone hats can be used as cute bottle toppers or for cute table decoration & more. 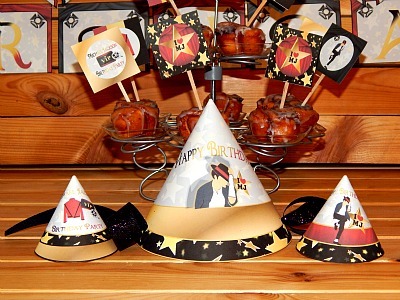 Mini hats & standard hats are great additions to make your unique theme party look fab! Cupcake toppers can be used for a variety of things. These are great if you'd like to make party favors. They work great to turn regular items into themed items. Cupcake toppers can be glued or taped onto toothpick sticks & put into finger foods, cupcakes, cakes, & more! Works awesome as gift tags too. Simply punch a hole through the top, loop string through the hole & add the tag to your items. Trim & paste them onto strips of paper to create napkin rings, add onto small paper bags, cups, boxes, bottles & more. Get crafty with these little party tags. Place cards can be used to named party food dishes, game stations, desserts, drinks, & for table seating. Place cards can be cut in half & used as labels for jars, cans, & more. 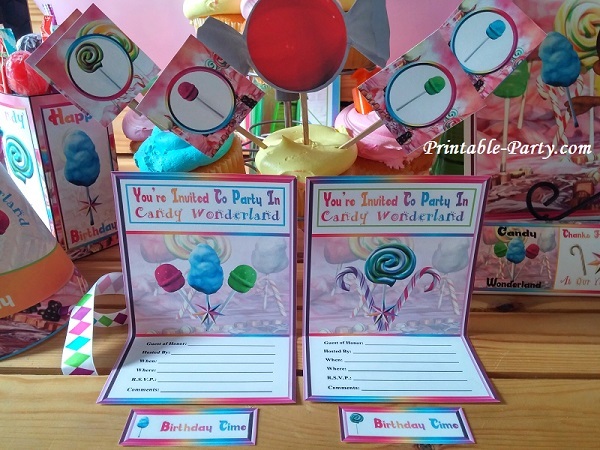 You can hand write the food items you are serving, write fun made up themed food names, or guest names onto the tent cards, by using a marker, pen, or glitter glue for an eye popping look. Our printable candy bar wrappers are designed to be wrapped around 1.55 ounce flat rectangle candy bars. Labels fit the best when wrapped around any flavor of Hershey's brand 1.55 oz chocolate candy bars. Add foil onto chocolate bars before wrapping with the label, if you want an old time classic candy bar look. scissors, tape, or glue stick is all you need to assemble a candy bar into a wrapper. 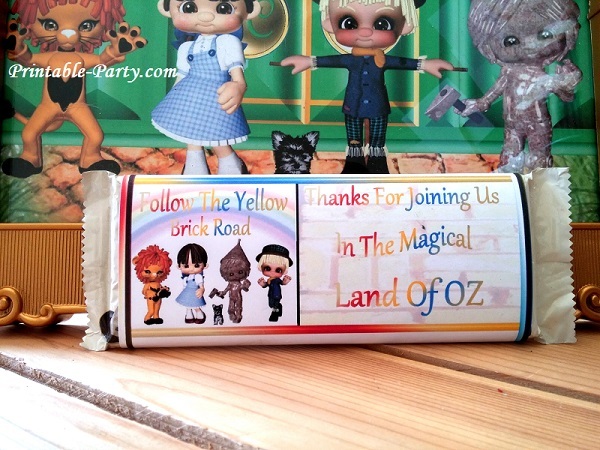 Our printable candy bar wrapper party favors are a great themed way, to say thank you to your guests for attending your party. 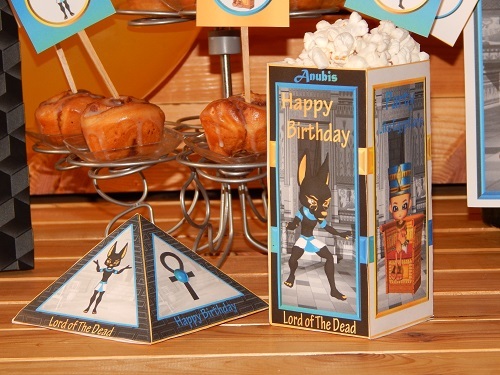 Printable party snack boxes are great for dry snacks or small partying gifts. Snack boxes are designed in a variety of shapes & sizes. Can be used to serve your guest appetizers in party themed boxes. Can also be used to give your guest partying gifts as a way to say thank you for attending your party. Boxes are usually easy to assemble & they are great to use if you'd like to tie your party theme into everything for a stylish looking party. Boxes can be placed into clear or colored cellophane bags to keep treats, snacks, or appetizers fresh. Bags also work well to secure some small partying gifts. Bag toppers are fab to use for a themed way to serve small lunches to your party guests. Bag toppers are designed & sized to fit onto folded standard sized lunch bags. Ziploc bags may work as well. 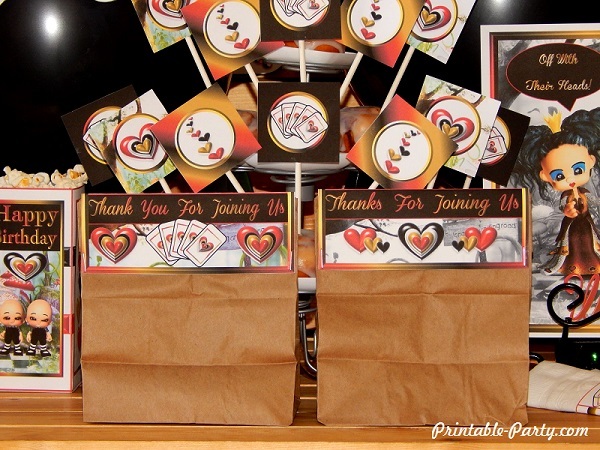 Treat topper printables can be used for party favors or snack bags as well. Simply place your desired food, snacks, lunch foods, or party favor gifts into a standard lunch bag, cellophane bag, or ziploc bag & staple or glue flaps together onto the closed bag. Our printable party invites come in a variety of different sizes & shapes. Some come in centerfold, tri fold, circles, 4x6, 5x7, diapers, onesies, & more. The printable invitations are pretty easy to trim out for you to hand write your party details into them. You can also add your party details on the line digitally by using the Adobe PDF Reader sign tool once you've opened your product in the program. 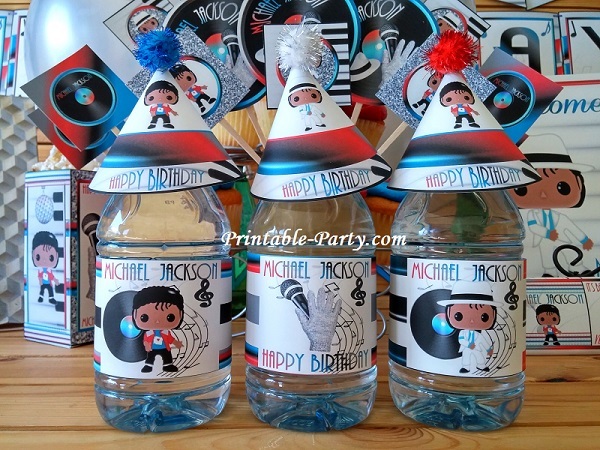 Bottle labels are perfect making your theme party eye popping. They make water bottle & any personal sized drink bottle look great. Bottle labels can also be used as garland circles. All you need to assemble them is tape. Simple wrap the two flap together in the back of the bottle and tape them together. You can trim off any extra label if it is to long for your type of bottle. These can also be used on juice boxes as well. Printable napkin rings make any napkin look jazzy to cute. Napkin rings can be used on paper napkins as well as cloth napkins. They are very easy to assemble. All you have to do is trim them out and wrap them around your napkins. Add a piece of tape to secure the two flap together in the back. Printable signs come in sizes 8.5x11 inch rectangles, 10x8 inch ovals, 8 inch circles, shaped cutouts, & more. 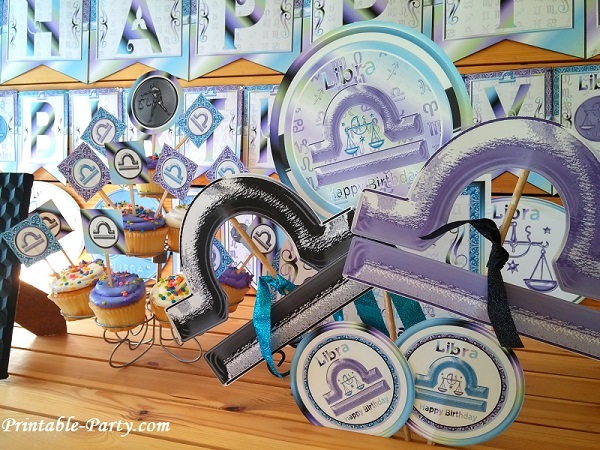 Using party signs is a great way to show off your party theme. You can use party circle in centerpieces and tape them to a wooden stick. You can hang them with strings from the ceiling. you can make a collage, you can print them onto t shirt transparencies to create themed party shirts, & more. 8.5x11 inch rectangle signs fit into any8x10 inch picture frame.